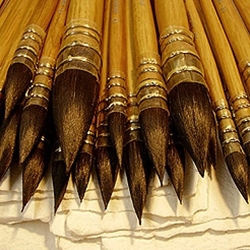 FineArtStore takes pride in the fact that we carry a wide variety of high quality artist brushes. If you come into our store you will notice that we have even dedicated a complete aisle just to these beautiful artist brushes. You will find all of your favorites like Arches, Escoda, Da Vinci, Winsor & Newton, Robert Simmons, Liquitex, Princeton, Jack Richeson, and many more.